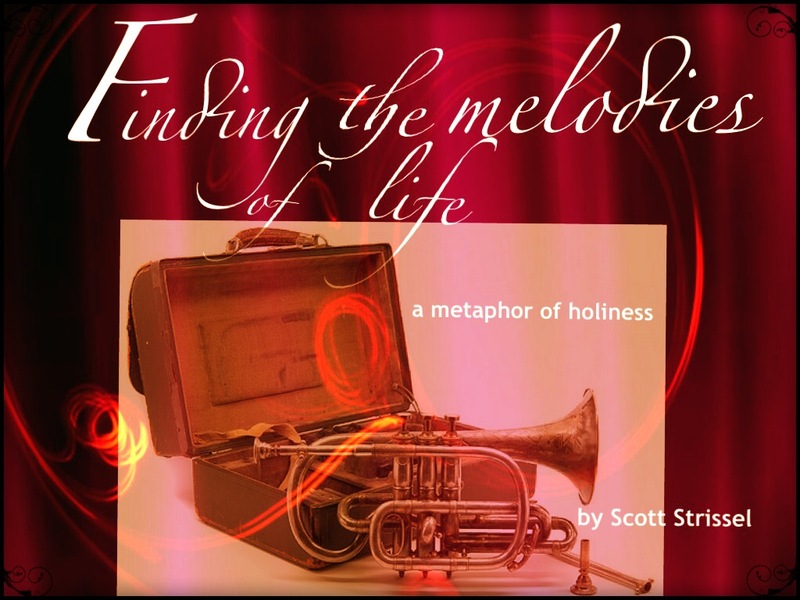 I must be careful here when I use this metaphor comparison of practicing to become perfect in music to be similar to holiness. We must strive for excellence in our personal and spiritual lives, this is true, but holiness is not perfection in the way that we view earthly perfection. The literal meaning of the word qadosh which we use when we refer to holiness is not perfection, but rather it implies the personal intent to be set apart. Being set apart means that we as children of God (those who have a relationship with Christ) must separate themselves from the old ways of living…in this we must practice and strive for excellence. Being set apart takes practice and discipline. When we become saved we receive the Holy Spirit (initial sanctification) we are made aware of our short comings and sin. At the altar we commit our lives to Christ, it is at this point that the Holy Spirit begins this work within us to help us maintain the commitment to Christ to remain set apart. In the Wesleyan tradition they would call this progressive sanctification, meaning that the Holy Spirit’s help enables us to make steps towards reflecting the very image of Christ in our lives. Is entire sanctification possible? Yes, but let me again reiterate that our aim is not perfection but reflection of Christ. Practice makes perfect…perhaps we should alter this phrase to say, practice makes qadosh. Coming home from school when I was just learning to play the cornet was something I began to dread. I knew that as soon as I came home, I would have to make my way across the courtyard where we lived in the church parish house into that tiny chapel and pick up my instrument and begin to practice my scales. I began to hate coming home after school to practice. While I was sitting in that little chapel, my friends were having the time of their lives playing soccer and having wild adventures and doing it all without me there. But day after day, hour after hour, I would sit there and try to make that cornet sound like an instrument instead of a screeching and dying animal. Many times while in these practices I would become frustrated with the lack of progress I was making. I would want to quit numerous times but over the frames of his glasses, my father would look at me and remind me that “practice makes perfect”. Boy did I begin to strongly dislike that phrase! What does practice makes perfect mean anyway? Is it just something someone says to keep another striving harder? There in that little chapel, sometimes with tears in my eyes as frustration mounted, I wanted to do anything but practice…in fact I wanted to run away from it all, to quit and not look back…but I didn’t. As I’ve grown older and hopefully wiser, I can now see the wisdom in that phrase, for as a child I needed prodding, encouragement and even discipline to complete the task of practicing, let alone perfecting anything. Over and over I would try, and over and over again I would fail. When confronted with a task such as practicing, failure is a very real, tangible practice partner. Ask anyone and I’m almost positive that they would agree that failure at something, anything is never our aim or desire! Failure, in my opinion is feared above most things. But when failure is viewed in the aspect of practicing, one learns to embrace it. Don’t misunderstand me though, I don’t mean to say that we strive to fail, but what I am saying is failure journeys along with us in the practice room as we strive to perfect the music. Failure is a part of the practice; it is both to be hated and something to motivate us to do better next time thereby removing that failed attempt and replacing it with a successful one. When I sat in that little chapel practicing for what seemed like hours, I was being set apart to get the music right. I wasn’t placed there to make the music sound perfect but in my practice I was striving to sound better, to play better and more confident in my music abilities. God created each of us for His holy purpose. He wants fellowship with us on a daily, even moment by moment basis, but without the practice of spiritual disciplines which includes intentionally setting ourselves apart with the intent to study of His word and prayer; we will not truly become His holy people. The practice of solitude with God means that we MUST set aside time for the most important relationship that we have here on earth and beyond. Holiness cannot take up root in our lives, or will be extremely stunted if we do not seek to have qadosh as a key ingredient. Being set apart means so much more than just getting away from the old sinful life, it means that we are intentional about living for Christ every day…and that takes practice! Is it your desire to be changed by the Holy Spirit for a holy purpose? Then practice it daily even moment by moment! Without personal intent within the realms of Holy Spirit led prodding we will not become proficient children of God. Upon his love I feast. He keeps his temple clean. He drives my foes away. The Song Book of The Salvation Army: Issued by the authority of The General.